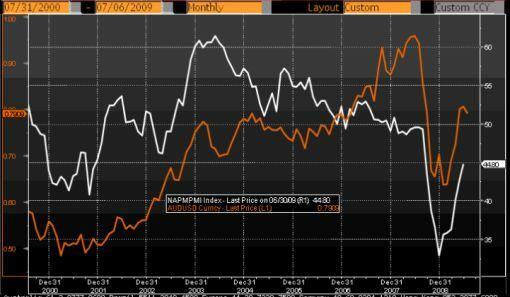 Here is an interesting chart illustrating the correlation between the AUD/USD (orange line) and U.S. manufacturing ISM (white line). If you surprised by this relationship, don’t be because AUD/USD is frequently perceived as a high beta, hyper cyclical currency. Therefore a recovery in U.S. manufacturing should equate to a recovery in the AUD/USD.